Ever wanted to participate in the process of high scientific discovery but did now know who to ask. 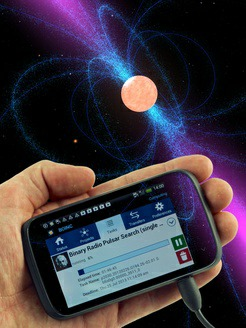 Here’s an idea.Download Einstein@ Home on your home computer and participate in a global hunt for new pulsars (rapidly spinning neutron stars) in our universe with the help of University of Wisconsin and the Max Planck institute. The global research project which has been on since 2005 and has 335,000 global users (or should I say researchers) helping scientists discover new objects in faraway galaxies. Here is how it works – data from the LIGO Gravitational Waves detector and the Arecibo radio telescope is processed on researcher’s idle home computers and searches for new radio sources and gravitational wave anomalies using the software BOINC (Berkeley Open Infrastructure for Network Computing). Einstein @ Home is part of the growing trend of Distributed Computing projects where researcher’s computers are used in a coordinated way to act like one huge supercomputer (Einstein @ Home computes at 1005 PetaFLOPS – which would make it one of the top 20 most powerful supercomputers in the world) that can crunch large amounts of scientific data to make discoveries. The trend was pioneered in the 90’s with SETI @ Home (which stands for the Search for Extraterrestrial Intelligence) which looked for radio signals from space. While SETI was not found, Einstein @ Home has found many new exotic stars (which may be the work of ET anyway!). The project discovered the world’s fastest spinning (8.6 milliseconds) binary pulsar and is now looking for the world’s first discovery of a 1-millisecond gamma ray pulsar using data from the Fermi satellite.